This is the place for new 2011 Mustang Diecast Cars. I'm constantly looking for new additions, so if you don't yet see what you want, keep checking back. You'll find not only a standard 2011 Ford Mustang, but tuner models as well, including Shelby, Boss 302, Ford Racing and more. Here's what's new. Well, we know it's a 2012 Boss 302, but it's part of the 2011 Model year, so the manufacturer classifies it as a 2011 Mustang Diecast Boss 302. 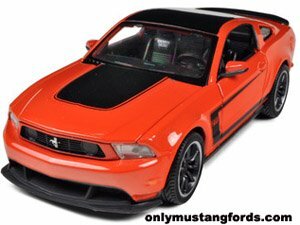 Either way, you can be one of the first to get a new diecast 2012 Ford Mustang Boss 302 in Grabber Orange. This new diecast car model is crafted in 1/24 scale and reveals the famous new Mustang Coyote 5.0 liter V8, pounding out 440 horsepower, plus a nicely detailed interior . From the picture, you could be forgiven for thinking that this 2011 Mustang GT die cast beauty was a photo of the real thing. And that just goes to show how true to the 5.0 Coyote V8 thumping, awesome good looks of the real thing, the makers of this sweet 1/24 scale wonder created it. From the blackened lower body molding to the authentic looking Mustang GT alloys, at this price, it's a steal. Great under the tree, but bound to look even better on display. 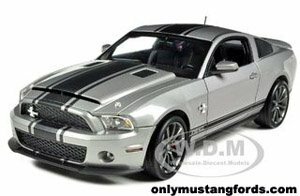 How about a 2011 Shelby Super Snake just made available in 1/18 scale. Equipped with steerable wheels, opening doors, trunk and hood and a finely detailed engine compartment and of course, the famed Shelby stripes and Cobra logo. Shelby made sure that this 2011 Mustang ain't no secretary's car. This awesome red 2011 Shelby Mustang GT-500 pumps out 550 horsepower (up from 2010)and is about the most civilized factory race car you can get from a domestic auto manufacturer. Ok. So you'd rather have a less refined "gentlemen's GT" and want more raw Shelby. This 2011 Shelby GT-350 might just be the ticket. Decked out in the iconic Wimbledon white, with blue racing stripes, it's a modern throwback to the original Shelby GT 350 from 1965. Looking For Other Years ?